Our technician will do a complete cleaning of your boat and provide you with picture report of the status of your underwater component. We specialize in bottom cleaning, installation of zincs and minor repairs. We are a distributor of numerous brands of zincs and offer competitive pricing - just ask your technician and they will be happy to go over the various options and prices. To dispatch a highly trained and dedicated technician to your vessel’s berth on time and ready to take on any task. 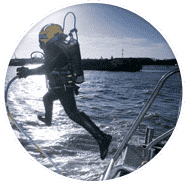 We are diving-certified and have the tools that will allow us to take on any job.